Nectifirm Review: Is product a Scam or Legit? At the present moment, there are a lot of companies delivering anti-aging products on the specialized market. Many of them promises to minimize the signs of aging but their actual level of efficiency is quite reduced. It is also possible that harmful ingredients are used, increasing the risk of allergies and acne breakouts. If you are interested in using anti-aging products, a careful research is first and foremost required. In the paragraphs that follow, we will review Nectifirm, a product that promise to improve the aspect of the skin in the neck area. 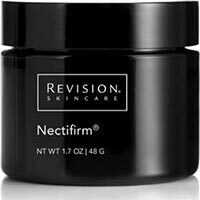 Nectifirm is an anti-aging product presented by Revision Skincare, being recommended for improving the appearance of the skin in the neck area. The main idea behind this product is to give your skin a natural lift, thus minimizing both fine lines and wrinkles and taking years off the neck skin. According to the manufacturers, this anti-aging cream can be used by all skin types, including sensitive ones. Nectifirm contains a number of active ingredients, including natural extracts from plants and antioxidants, destined to work together and actively improve the appearance of the skin in the neck area. Its manufacturers state that the regular usage of this product will ensure that the neck skin becomes smoother and softer at the same time. Your neck skin will look young, firm and lifted, Revision Skincare experts say. Moreover, due to the unique blend of ingredients, the skin will no longer have a rough texture, with fine lines and wrinkles being less visible. What are the ingredients contained by Nectifirm? Each ingredient contained in Nectifirm has been chosen with a specific purpose. For example, the algae extracts have been chosen in order to prevent moisture loss and ensure a toning effect on the skin. Palmitoyl tripeptide-5 works on fine lines and wrinkles, while a combination of saccharomycescerevisiae, Palmitoyl hexapeptide-12 and Palmitoyl tetrapeptide-7 guarantees the firming and lifting of the skin. Ceramide 2 ensures the hydration of the skin, while dihydromyricetin works to eliminate the rough texture. A combination of glucosamine, bamboo, and English pea extract smoothes the skin, working once again on fine lines and wrinkles. Last, but not least, vitamins C and E are active ingredients with skin-brightening and toning properties. Are there any product weaknesses to consider? It has been stated that the product might not work on deeper wrinkles or be able to eliminate all wrinkles one presents in the neck area. Like other anti-aging products, it may take a couple of months, before the first results become noticeable. The majority of the reviews that can be found on the Internet are positive. Many of those who have used this anti-aging product, say that it is quite effective, minimizing the appearance of fine lines and wrinkles in the neck area. Only a few reviews mentioned that the product did not make a notable difference regarding the appearance of the neck skin. No reports have been encountered regarding allergic reactions or side-effects caused by the application of Nectifirm on the skin. How should you use Nectifirm? Always apply Nectifirm with strokes in the upward direction, making sure that the application is not too aggressive. Apply the cream in the entire neck area, reaching as far as the jaw line. It is recommended to apply Nectifirm in the morning and at night, each day, for the best results. The research performed on the Nectifirm product has revealed that we have come across an efficient anti-aging cream. Even though some reviews might state that it takes a long time for the first results to appear, you have to understand that all anti-aging products require a lot of time to show their magic.